Nature Valley started out as a cereal manufactured by General Mills in 1973, but it was quickly followed by the granola bar in 1975. Today, you can find a number of different types of Nature Valley granola bars: crunchy, chewy, sweet or salty. The Nature Valley Oats 'n Honey bar is a crunchy variety that is low in saturated fat and a source of fiber and iron, but it's also a little high in calories. Two Nature Valley Oats 'n Honey bars -- the suggested serving size -- are 42 grams and contain 190 calories. This means that one serving of the granola bar contains 4.5 calories per gram, making it a high-energy-dense food. This is food that has a high calorie content compared to its weight. People typically eat about the same amount of food each day, regardless of calories, according to the British Nutrition Foundation. High-energy-dense foods are not as filling as low-energy-dense foods, and if you eat too many high-energy-dense foods, you might get more calories than you intend to consume. One serving of the Nature Valley Oats 'n Honey granola bars contains 29 grams of carbohydrates, 12 grams of sugar and 2 grams of fiber. 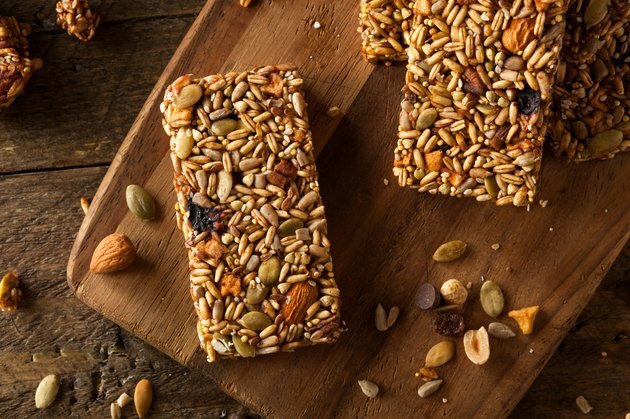 Although the granola bars are a source of whole grains and fiber, they are not a very good source. According to Harvard Medical School, a good whole grain should contain 1 gram of fiber for every 10 grams of carbs. This Nature Valley granola bar contains just more than half a gram of fiber per 10 grams of carbs. Two Nature Valley Oats 'n Honey granola bars contain 4 grams of protein. How much protein you need to eat each day depends on your age and gender. In general, adult women need 46 grams a day, while men should get 56 grams a day. The bars are not a significant source of protein, but most Americans get more than enough protein in their diet, according to the Centers for Disease Control and Prevention. The granola bars are a source of fat, with a small amount of saturated fat and no trans fat. Two bars contain 6 grams of total fat and 0.5 grams of saturated fat. Higher intakes of fat, saturated fat and trans fat are associated with higher rates of heart disease. According to the Dietary Guidelines for Americans 2010, you should limit total fat intake to 20 to 35 percent of calories, and you should limit saturated fat to less than 10 percent of calories. The guidelines recommend that you try to limit your intake of trans fat as much as possible. One serving of the Nature Valley Oats 'n Honey granola bars contains 160 milligrams of sodium. Getting too much sodium in your diet increases your risk of developing high blood pressure. For improved health, limit your daily intake to less than 2,300 milligrams a day. The granola bar is not a significant source of any vitamins or minerals, but it does contain a small amount of iron, less than 1 milligram. One serving meets 4 percent of the daily iron needs for women. Iron is a nutrient of concern for women of childbearing age and adolescent girls. Iron is important because it helps make the proteins that carry and store oxygen in your body. Failing to get enough iron in your diet can lead to anemia. British Nutrition Foundation: What Is Energy Density?